I’ve had a great time the past several weeks going to the market, picking up interesting winter produce (hard shelled squashes, root vegetables, etc.) and trying new dishes. Recently, I went to the market with the idea of making a very tasty, cozy and comforting cabbage chowder, but then I came across parsnips and sunchokes (Jerusalem artichokes) and immediately knew I wanted to combine them in this creamy, earthy and Indian-spiced soup. The savory and sweet topping is optional, but it takes this soup to a different level. 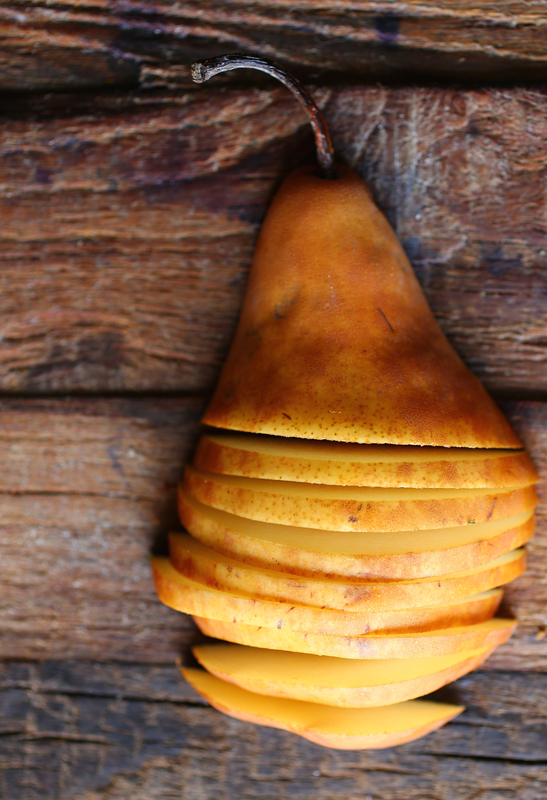 The pear and walnuts add a bit of sophistication, texture, and down-to-earth flavor. I ended up making both soups. Both were delicious. You can check out the cabbage chowder after you try this one! For added texture and flavor, serve with a grain like farro, barley or brown rice. The original recipe comes from Marcus Samuelson’s Marcus Off Duty. In a large saucepan, heat the olive oil. Add the parsnips, sunchokes and garlic and cook over moderate heat, stirring, until slightly golden, about 5 minutes. Add the garam masala, cumin, turmeric and salt. Cook, stirring, until fragrant, about 2 minutes. Add the water, vegetable broth and coconut milk or cream. Bring to a simmer and cook until the vegetables are soft, about 20 minutes. Purée the soup in a blender until very smooth. Pour the soup into a clean saucepan and stir in the lemon juice. Season with salt and pepper. To make the topping, heat olive oil under low heat, add the walnuts and cook and stir until golden, about 3 minutes. Remove from the heat and stir in the garlic and lemon juice.Transfer mixture to a small bowl and toss with the walnut oil. Cool to room temperature, then stir in the pear, parsley and tarragon. Season with salt and pepper. Ladle soup into bowls and sprinkle with the topping. Notes: As with many soups I make, I served this one with a grain, cooked farro, and loved the added texture. If using farro or another grain, add to bowl first and then ladle the soup on top, followed with the topping. Love it. Just gorgeous soup with hearty ingredients n spices. Thank you so much Cris! I hope you get to try this soup sometime. This looks bloody glorious! Your food photography is absolutely exquisite. 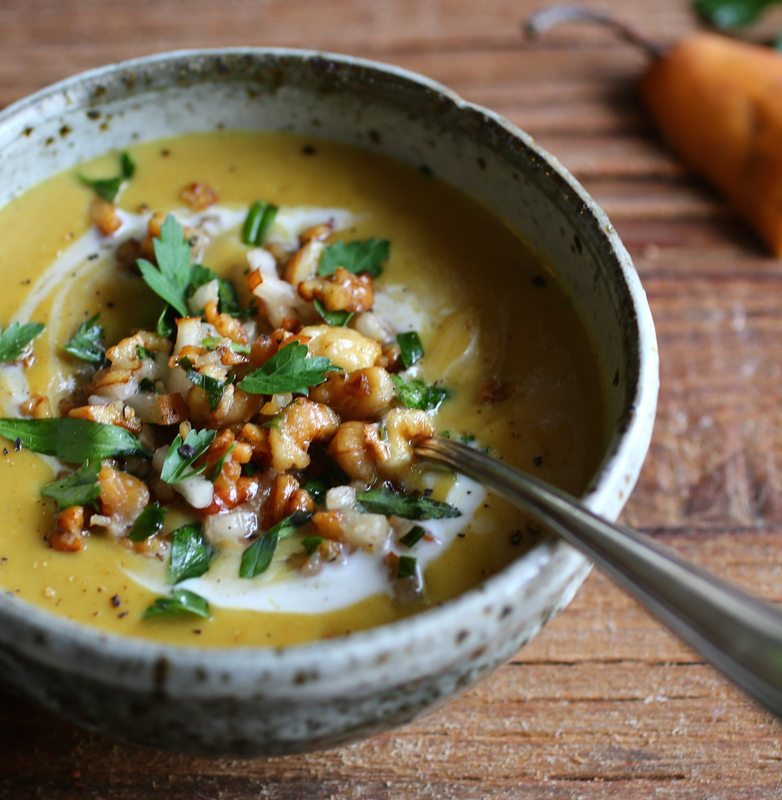 I’ve never made parsnip soup – so it’s definitely next on the list! Thanks for sharing such a delightful recipe! Thank you so much for such lovely and kind words!!! So happy you like my soup and photography. I’m an amateur so I’m really trying to improve my photography skills! So thank you, your comment means a lot and is really appreciated! When you try this recipe, please do let me know how you like the soup when! Until then, Happy Holidays! Thank you Meg! So glad you like it! Yum this looks so good! Pretty photos, love that bowl! Thank you so much! So glad you like the recipe and the handmade bowl! This looks amazing and your photography is on point! Thank you so much! I’ve been having a lot of fun trying to improve my amateur photographic skills! I appreciate your kind words!!! So happy you like the look of this soup too! I hope you try it and love it! What a beautiful soup! I just brought home a bunch of sunchokes from the market without any real plan for what to do them, just a vague idea that soup would be nice. I’m so happy to have come across your beautiful recipe! Awesome! So happy you found this recipe at such perfect timing! 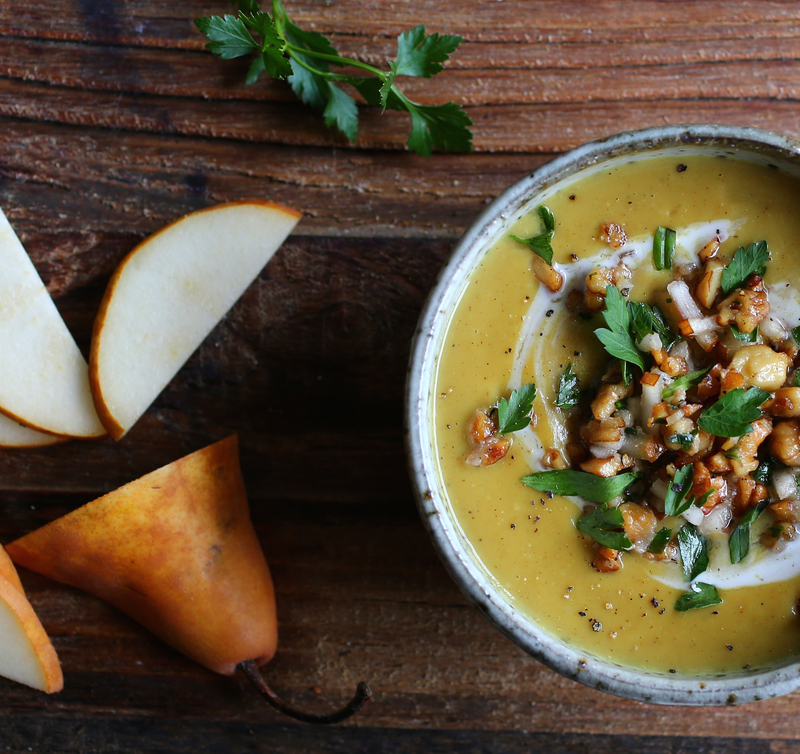 I hope you love the use of your sunchokes in this soup! Please do let me know your thoughts when you try it. Happy Holidays! This soup looks absolutely delicious! Thank you Marcia. So glad you like it! Sunchokes are still available here at the Co-op! I’m making this one for sure. Today is a perfect day for this soup with the rain and possible thunderstorms on the way. Great! This rustic soup is great for a rain day! I really hope you like it!